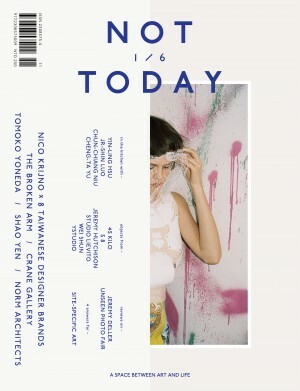 6/6, NOT TODAY has reached the end of its volume 1. This issue focuses on local. There are more Taiwan related items in OBJECTS. We met two ladies from the art industry for INTERVIEWS. Sound artist Yung-Ta Chang is the paper DJ for THE PLAYLIST. Artist Liu Yu has become a stalker and she took her FIELDNOTES on facebook everyday. For A SPACE FOR_____, chef Joël Chen searched for hometown images of his childhood as well as artist Yi-Hsuan Peng created imaginations of an exotic destination. CURATOR Freya Chou TRIPPED to Berlin and brought us a poem from Dorothea Lasky. In GEZELLIGHEID, photographer Annabel Miedema shared her flavoursome moments with XIEXIE tea girls. 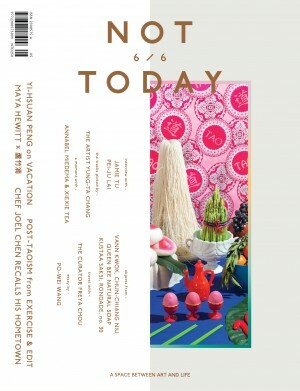 Talented duo Exercise & Edit proposed an unorthodox food-making idea of post-Taoism for THE KITCHEN. In HI TAIWAN, artist Maya Hewitt went to Luzhunan. The ambiguity in landscape created a mixture impression of time and space throughout her residency. 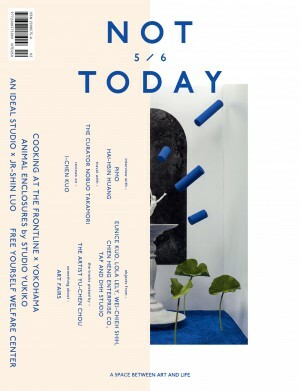 Waving goodbye to the slowly built-up past, the 5th NOT TODAY has launched. Mixing with design items, artworks and daily use products, we see perspectives of life in OBJECTS; There were 2 visits in New York for INTERVIEWS. THE PLAYLIST chosen by artist Yu-Chen Chou. For A SPACE FOR_______, a private zoo scene created by Studio YUKIKO. Artist Jr-Shin Luo and his (or everyone's) assistant Sharon talk about the creation and imagination of an ideal studio. At WELFARE CENTER, artist New-York Chi made a series of sports facilities. At CURATOR'S TRIP Nobuo Takamori with a Taiwanese passport to cross borders in Western Balkan Peninsula. Designer Margrethe Odgaard and chef Jakob Mielcke collaborate to create the UMAMI taste for THE KITCHEN. In HI TAIWAN, the Sun Self Hotel in Nanjichang starts welcoming guests. For an extended reading, the artist collective Cooking at the Frontline built an innocent restaurant in Yokohama, Japan. Special feature: SOMETHING SPATIAL in collaboration with Art Kaohsiung. One year has passed. There is the fourth NOT TODAY. Special feature: Paper exhibition “Never odd or eveN” curated by Esther Lu. Summer is here. 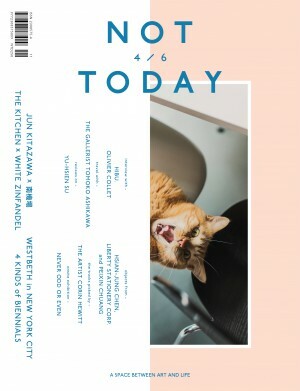 The third NOT TODAY arrives with fervor. Ting Cheng did a photoshoot called Do You Good for the COVER STORY. 2 INTERVIEWS were done in Shilin,Taipei and Nara, Kyoto, separately. In THE KITCHEN,Thai Mama cooked authentic Thai dishes at a specialist agriculture bookstore that was restored from a 100-year-old hotel in central Taiwan. For SOMETHING SPATIAL, something there is about artist-run initiatives. A SPACE FOR_____ has the ultimate platform for Foamboys and Marble Deers. A CURATOR'S TRIP made between Taipei and Tokyo. Nicholoas Brook got his very first footsteps in Haulian for HI TAIWAN. 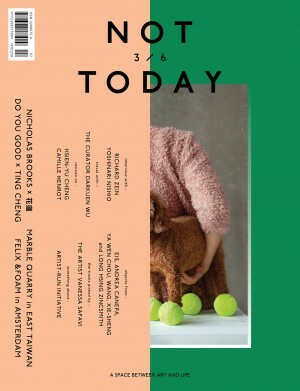 Continuing the debut issue’s scale, the second NOT TODAY has come out, with finer details and more appealing stories. Another 6 items in OBJECTS; 2 visits to Frankfurt am Main and Buenos Aires for INTERVIEWS. The wonderful duo from Thisispaper made dumplings and borscht and potato cheesecakes for THE KITCHEN. As SOMETHING SPATIAL, this time is about artist-in-residency. A SPACE FOR_____Wiels in Brussels and 182aerspace in Tainan. A CURATOR'S TRIP in San Francisco; FASHION GAMES with Super ADD and Chun P. Lin; PLAYLIST by Yun Chen and finally Debbie Tea visited Sanchong for HI TAIWAN round 2! Special feature: A booklet of THE LIVING UNIVERSE. Jamais deux sans trois (never twicewithout a third); without coincidences there would be no stories. 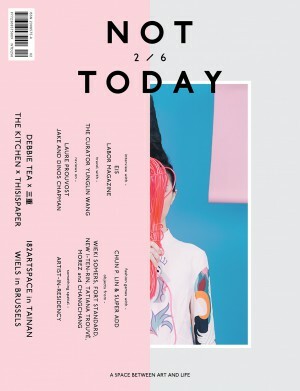 For this first issue of NOT TODAY, we came up with a number of interesting sections. In OBJECTS we selected 6 different items that shine through our daily life. We conducted INTERVIEWS with fashion designer SHAO YEN and design studio NORM ARCHITECTS at the places where they live and work. In THE KITCHEN, we present a five-course dinner by young artist Yin-Ling Hsu. Entering SOMETHING SPATIAL, you could have your answers for site-specific art. In A SPACE FOR ______, you will find yourself encountering The Broken Arm in Paris and Crane Gallery in Kaohsiung. Furthermore, we invited foreign artists to work on something Taiwanese—Cape Town based artist Nico Krijno shot a fashion story with 8 Taiwanese designer brands, and established Japanese artist Tomoko Yoneda accepted our invitation to partake in the HI TAIWAN project; she went down to southern Taiwan and brought us a series of beautiful images of the town Jingliao. It’s all about space perception. We want to talk about all kinds of concepts about spaces that exist in our daily life and conceptual mind. By talking about it, we elaborate how art plays in-between.